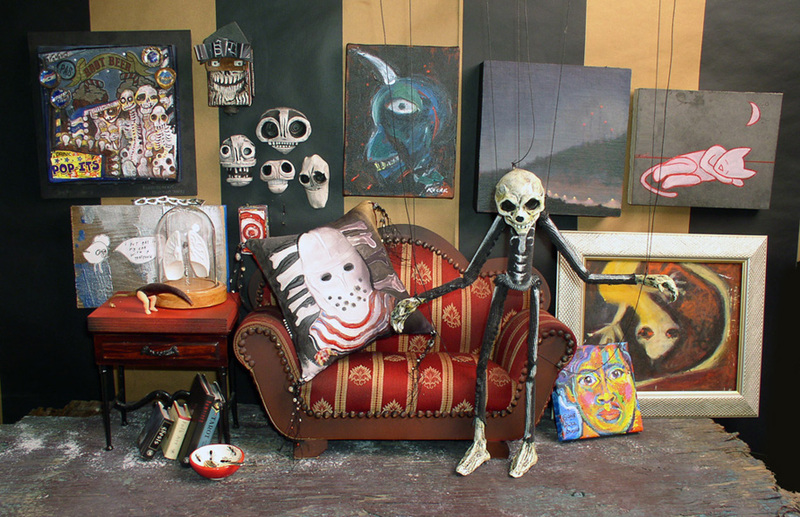 Clockwise from top of table: Kate Budd (pepper); Todd Lynch, John Ryan, Nina Huryn, Mark Yasenchack (4 skulls); Nina Huryn (target), Nina Huryn (pillow); George Kocar, Jeff Yost, Paul Sydorenko, Terrie Gerrard, Anna Arnold, Scott Radke (marionette); Diane Stiver (bowl). "Creature of God: Fine Art & Crafts". I am seller "creatureog". Stop at these shops too: Mistress Rebecca and Baba Hepziba! Mexican Sugar Skull – here they sell everything you need to make your sugar skulls for Day of the Dead! Artists of Cleveland – check here for info about the annual ArtCraft Holiday Sale, including a list of participating artists. BrianMay.com – Queen guitarist speaks his mind! Check out his daily soapbox comments. Puppetina's Place – brilliant, colorful puppets for children. Obscura Antiques – strange and unusual antiques in downtown NYC. Gary Spinosa – "A Philosopher's Stone" a retrospective of Gary's mysterious work.